MOTIVATED SELLERS!!! Desirable Lake Keowee subdivision. 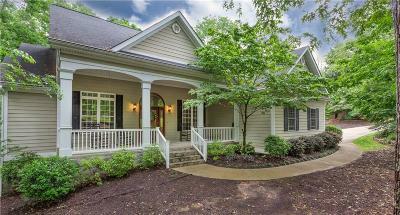 Charming home with 5 bedrooms and 3 full baths located in Keowee Harbours. Home sits on .67 of an acre as an interior lot. A boat slip is available. Beautiful landscaped yard and plenty of room for parking and guests with an oversized parking pad. You will first notice the covered front porch with stone steps. A great place to relax and enjoy conversation with family and friends. Curved arch ways decorate the two story foyer that leads to an open floor plan. A formal dining room and study are as you enter and Living Room has a tray ceiling and gas fireplace. The kitchen has recessed lighting, granite counter tops, and stainless steel appliances. A pantry in the kitchen allows for extra storage. The oversize windows let natural light flow into the kitchen and living room. Master Bedroom has tray ceilings and a walk in closet. Master bath has double sinks with granite counter tops, a separate shower and a jetted spa tub. A large deck with access from Master Bedroom and Living Room allows for a private retreat. A portion of the deck is screened that is perfect for morning coffee or entertaining. Home has a full finished basement with two bedrooms, one full bath, and second kitchen with bar. A large area of the basement can be used for entertainment or recreational area. Basement has a secondary entrance that could also be used for an in law suite. There is additional space in the basement that could be used for extra storage or even a shop. Home has a new HVAC system and new garage door system that can be controlled by smart phone. Home sits right across from the Clubhouse and Swimming Pool that makes the amenities very accessible but you still have the privacy needed. Great location that is close to Seneca and Clemson.